Painting outdoors is an exhilarating experience, and this workshop is ideal for artists who want to take the challenge of stepping outdoors to paint but don’t know where to begin or what to expect! 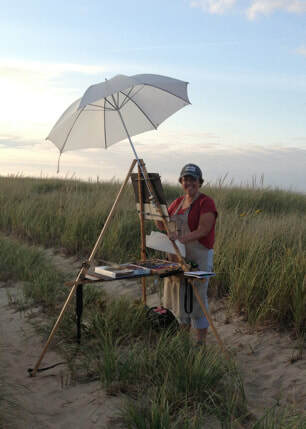 This workshop will provide artists with a introduction to the equipment used for plein air painting, ranging from basic hacks to items you can purchase. It will start with a talk/demonstration that will include samples of equipment, pointers for setting up on location, narrowing the field of vision, importance of thumbnail sketches and painting the values in the landscape. You will then have a chance to set up equipment that you bring with you and we will discuss options that may improve your plein air painting experience. Participants will have time to sketch and paint. If the weather is not cooperative, we will remain indoors. Betsy’s medium of choice is pastels but information shared will apply to other drawing & painting mediums as well. Come with what you think might work for outdoor painting. The first time I went out I used a TV tray! This is an introductory workshop so it’s not necessary to run out and purchase equipment. I will be showing some examples of easels as there are quite a few options. It is useful to have a camp chair and an artist’s umbrella, but they are optional. Depending upon the weather you might need sunscreen or bug repellent. Keep materials light and easy to carry, you do not have to bring all your paintings supplies.